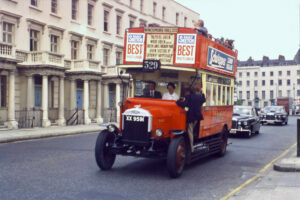 Between 1922 and 1934, some 220 independent companies operated buses in London, ranging from one-bus operations to organisations with over 100 vehicles. These companies provided competition for the London General Omnibus Company (LGOC) which had previously operated a near-monopoly but was regarded by many people as providing an inadequate public service. Although all operated legally, some of these independent companies were less than scrupulous in their business strategies, in some cases only working the most profitable routes and, even then, only during busy periods, leaving the LGOC to cover the less remunerative services. This business practice earned them the collective name of the “pirates” although many of the companies operated to high professional standards. Eventually accepting that it could not run the “pirates” off the road, the LGOC became grudgingly co-operative towards some of the independents, in many cases taking them over and, in others, even selling them redundant buses. The formation of the London Passenger Transport Board in 1933 put an end to all independent bus operations in the capital and the last of the “pirates” were taken over in 1934. For chassis manufacturers such as Dennis and Leyland, the independent operators provided an entrée into the London market previously denied to them because the LGOC only bought buses manufactured by its affiliate company, AEC. The Dennis chassis was a largely unmodified version of its standard commercial design and was fitted with a side-valve engine built at the company’s White & Poppe factory. In terms of numbers produced, the Dennis chassis was the most successful of the first-generation buses for the independent companies. The body-builder Christopher Dodson Ltd was also prominent throughout the independent era; Dodson himself was a great supporter of the “pirates” and would not work for the LGOC. His bus bodies were of high quality and he offered advice, as well as favourable financial terms, to his buyers. The history of D142 needs to be looked at from the point of view of the chassis and the body; chassis 40347 entered service in April 1925 with taxi-owner W H Cook, trading as Dominion Omnibus Company. Carrying a 48-seat body built by Dodson, the bus was finished in all-over red to which a white relief was added during its first year. It carried the fleetname ‘Dominion’ on the sides in a style of gold lettering which was said to have resembled that of the LGOC. 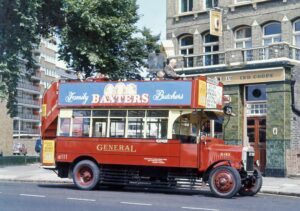 Dominion ran two Dennis buses on Uxbridge Road route 514 until March 1926 when the licences for that route were withdrawn by the authorities, following which the LGOC acquired the Dominion company in order to prevent it starting up operations elesewhere. After acquisition by the LGOC, the bus was numbered D22 and the body given number 9357, replaced upon overhaul with similar body 9262. Late in 1926, the bus was transferred to the fleet of Redburn’s of Enfield, another independent taken over by the LGOC but, at the start of 1928, that company was fully absorbed and the bus returned to the parent company. In 1928, the LGOC sold D22, along with others, to the London Public Omnibus Company who operated a large fleet of Dennis buses and who numbered the bus D142. It worked for Public on route 529 from Winchmore Hill to Pimlico. History repeated itself in 1929 when the Public company was in turn absorbed into the LGOC and the bus came into LGOC ownership for the third time, retaining fleetnumber D142 but this time its body being numbered 10896. It continued to work on route 529 out of Enfield garage, passing to West Green garage in April 1930 and receiving body no. 10846 upon overhaul in July 1930. A final overhaul in June 1931 gave it body no. 10837, which it retains to this day, and official records show it moving to Hounslow garage although other evidence suggests it actually finished its days at Hackney garage working route 96 from Putney to Wanstead until withdrawal from service in December 1931. 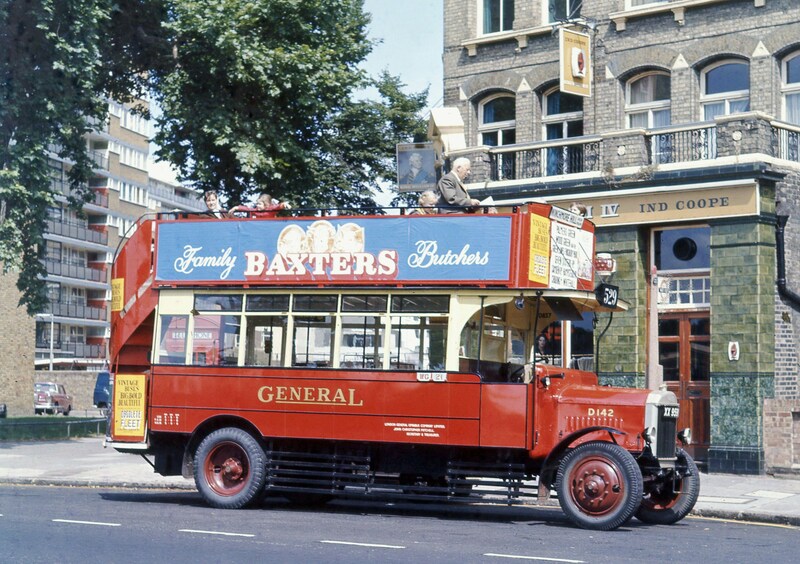 Body 10837 is also by Dodson and was originally fitted to another Dennis bus, registered XW 8201, new in January 1925 and operated by Paragon in red and white livery on route 526D between North Finchley and Wandsworth Bridge. In 1927, the company passed to Public and the bus became D61 in their fleet, eventually ending up, like D142, with the LGOC in 1929. In July 1932 the bus was sold to an F McKinless of Hendon following which nothing is known of its fate until it was discovered in 1971 at Wickford in Essex, covered in corrugated iron and in use as a store-shed, the fareboard for route 96 still on its bulkhead. Restored over the following 12 months, the body required remarkably very little work need to be carried out and the majority of the woodwork is original. When completed in 1972, D142 was sent on a 2000-mile tour of Japan on behalf of the Department of Trade & Industry and, upon return to the UK, undertook a promotional tour of the country for the English Tourist Board. After that, the bus re-entered service in London on tourist routes as well as making numerous film & TV appearances before being acquired by the Museum in 1984.